81: Cobble Gobble: Is China invading Europe one cobblestone at a time? This cobblestone in Geneva may have been relaid (sett) in modern times, but it is a good example of the use of water-polished eclectic riverstone. Our little town of Biel has a medieval district laced in cobblestone lanes that slope into the foot of the Jura Mountains. 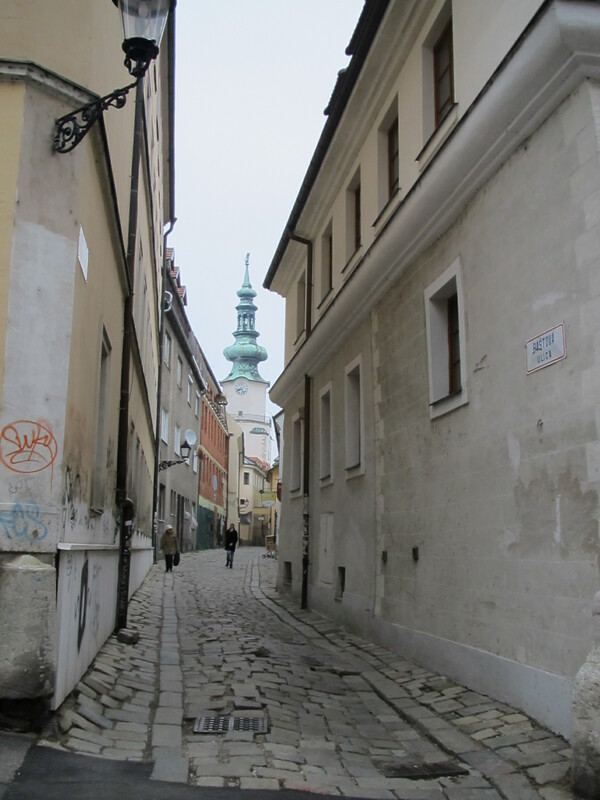 This gap-toothed cobblestoned street in Bratislava is pretty old and dilapidated, but you can see by the squared edges that these are still quarried stones and are therefore relatively modern. Not all is as it seems. The cobblestones are not genuine from the Middle Ages as is the village. They are in fact the same black-basalt-coloured cobblestone granite pavers you can have laid in your driveway. We’ve seen these types of pavers throughout Switzerland, France, Italy, Slovakia, Germany and Austria. They are a menace, in that in some places they are creeping in over ancient cobblestone streets because they provide a smoother surface. 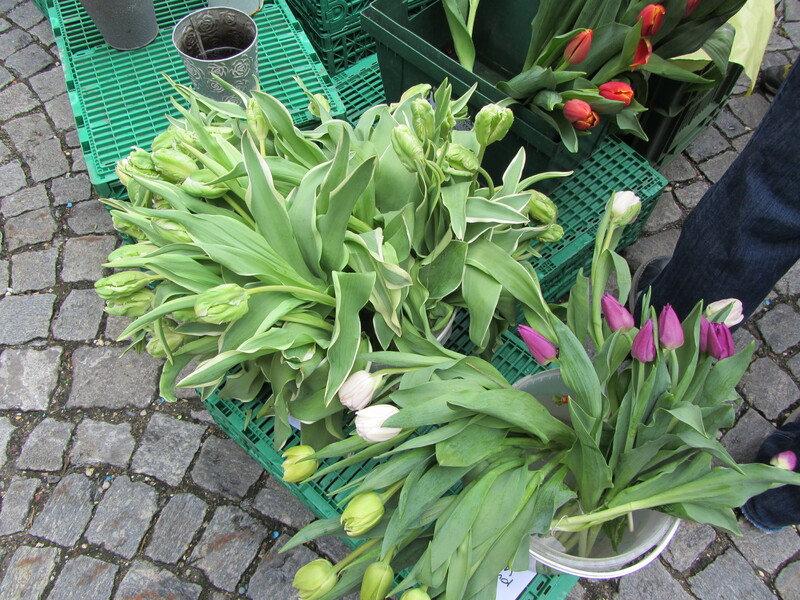 Nonetheless, they are still preferred over asphalt, which is what you will find in the charming cultural centre of Basel’s old-town. Shame. Authentic cobblestone streets can still be found: Bratislava has the most beautiful uneven cobblestone surfaces, which unfortunately I cannot find in my photo-files, dang! The only photo I can find is of a 1800s “sett” street. Setts hail from the era when squared and quarried stone became more available and towns started replacing local riverbed stone with the flatter setts. Even impoverished Bratislava is upgrading, so the old rounded riverbed stones that are of varying sizes and colours are on the way out. They are understandably not the easiest to traverse, rendered as they are into miniature hillocks by the pressures of time, the substrata and, of course, the weight of traffic. 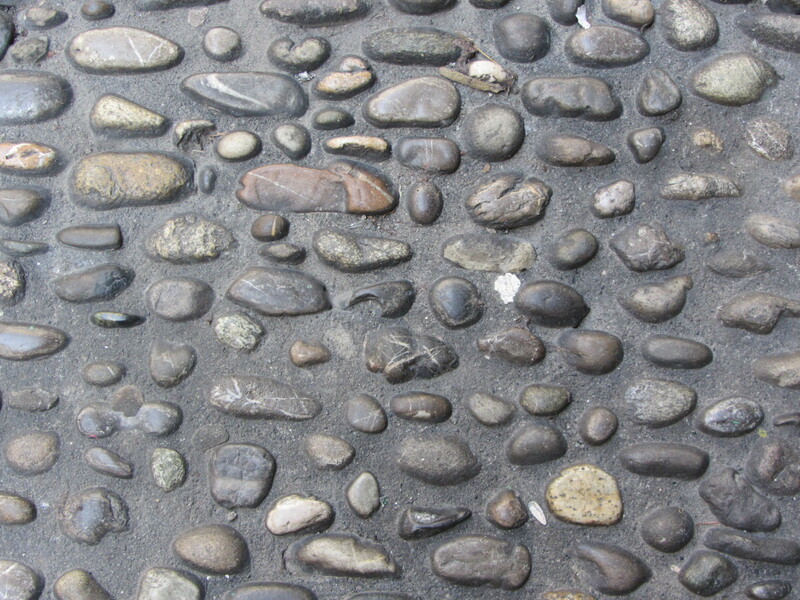 Cobblestone in Biel/Bienne's historic quarter. The lack of uniformity in each stone's size suggests these are not from China. It is perhaps a testament to Europe that its historic districts are far from static museum pieces. They are well-traversed, so its roadways are best if upgraded so that people don’t trip on every other step. 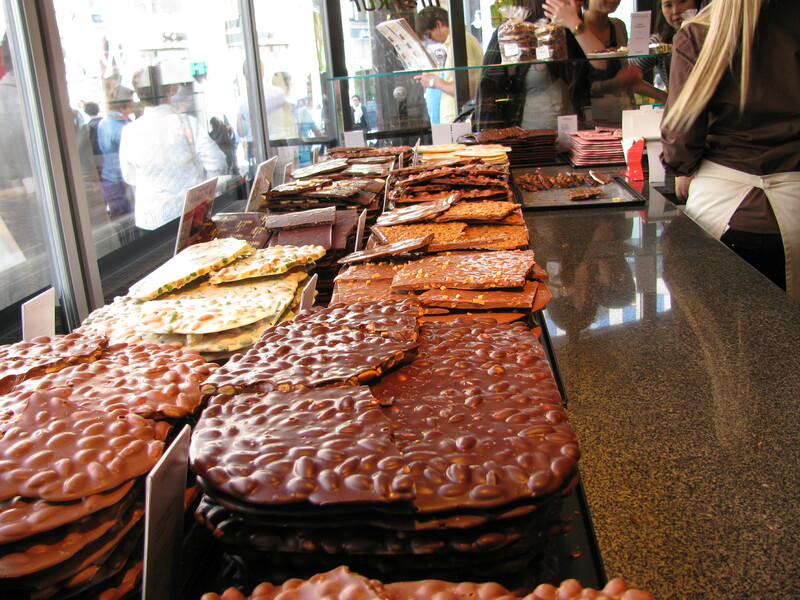 Solothurn, Switzerland is also home to genuine cobblestone, as are any number of tiny Swiss villages. The cobblestones date back to the 15th Century, and were usually taken from local riverbeds, hence each area’s stone roads are a stamp of the region’s individuality. I love the more recently added black paving stones, but they are the same anywhere you go in Europe or North America. I would have imagined they all come from Northern Ontario where black granite is in abundance, but more likely these streets are from China. Check out this supplier. According to Wikipedia – a not necessarily reliable source of information by the way – some cobblestone roads have heritage-designation and are protected, but I could not get a single government office to verify that. European cobblestone is not necessarily in danger. It can be purchased where else but the U.S. Here is one California, supplier who will happily ship it to you anywhere you like – maybe even back to Europe. 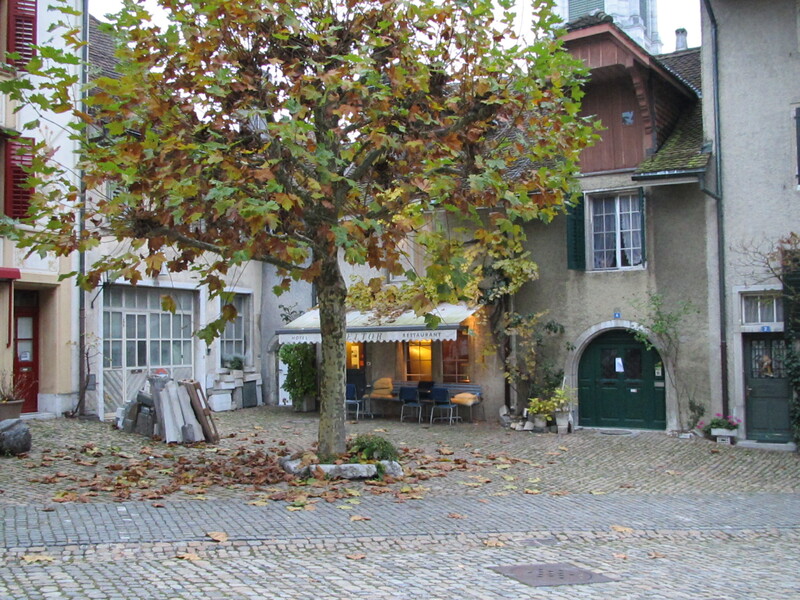 The grey 'path' along this Solothurn, Switzerland street is relatively new. If you look at the raw umber-toned stones in the courtyard and roadway, you will see they are of an older vintage The absence of uniformity in the street stone's sizes, colours and their rounded edges suggest they are much older and possibly drawn from nearby riverbeds (River Aar). Here's a closer look. Given the flatness of this cobblestone surface, it appears that it could be a relaid "sett" from the 1800s, but it also could be the original locally drawn riverstones. We have been on the road, or more properly, on the European railway tracks for the most part of the last eight days. Maybe seven days. I don’t know. The concept of time has lost all meaning. Travel does that to a person. It is very tough work. 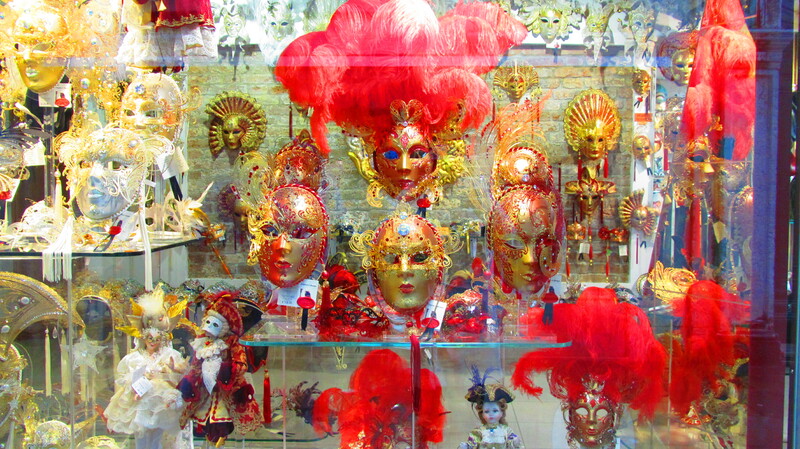 Tourists are all about seeing things, photographing things, experiencing things, buying things, doing things. It is an artificial existence, and so it is really hard to keep up for a long time. No need to shovel snow on these 'streets,' but wouldn't it be fun if they froze over? It would be the greatest ice-skating in the world. We should all feel sorry for those tourists who blithely book a six-month excursion. They have no idea what they are letting themselves in for. I can tell them: It will be a lot of pain and suffering, all while trying to look like they’re having the time of their lives so as to justify their investment of money and time. But I ramble. The point of this blog is to show a little of what it is like to move to a place, as opposed to just visiting there. But for the last little bit, we have just been visiting. It is tougher than we remember. We’re almost grateful to get back to work. 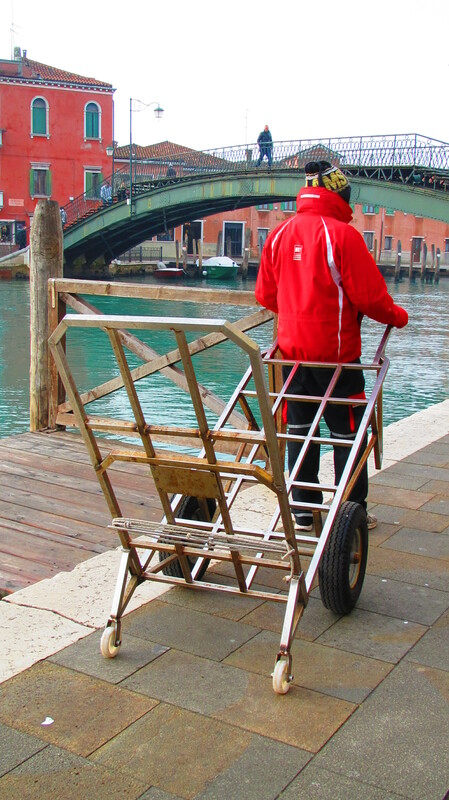 There are no motor vehicles on Venice or Murano avenues, so everything gets hauled by humans. This cart is designed to take stairs easily. It works beautifully. The best hot chocolate in the world can be had in Bratislava, Slovakia. This is a true fact. Vienna is much more fabulous than anyone could guess. Sorry to say, but Italian food tastes better in Canadian ‘Italian’ restaurants. The landscape between Milan and Venice looks a lot like Saskatchewan. 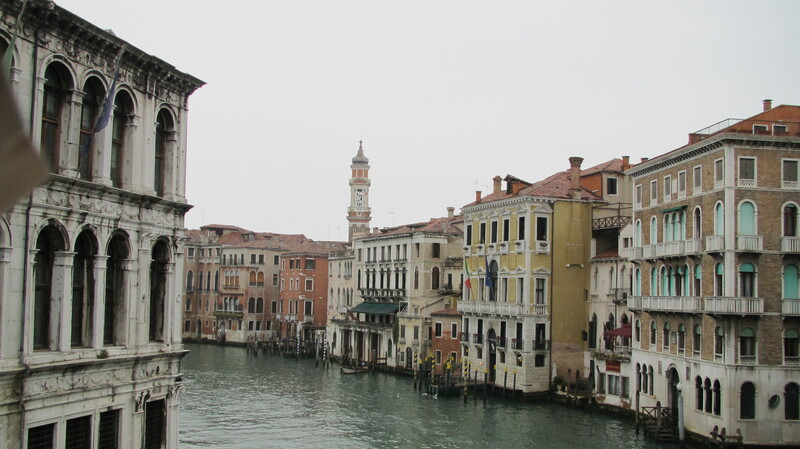 Venice has a regrettable spewage smell to it. I say spewage, because I doubt they would admit to it being sewage. We may have seen a spewage outfall directly into a canal in the heart of the city. It is worth the extra money to book a full sleeping compartment with private bathroom and shower on Eurail lines in Switzerland, Austria and France. It is questionable whether it is worth it to pay extra money for first-class on Trenitalia (Italian Rail). Their seats are a little like Mussolini – hard to put up with. Italy’s train service Trenitalia also recently laid off their senior staff to hire a bunch of cheaper new staff, putting people out of work who have been with the railway for 20-25 years. Boo Trenitalia. A handful of middle-age guys are protesting this in front of the Venice train station. They have been there for 25 days. Trenitalia is a real name. Check it out by clicking here. If you want something done, get a Swiss, German or Austrian national to do it. 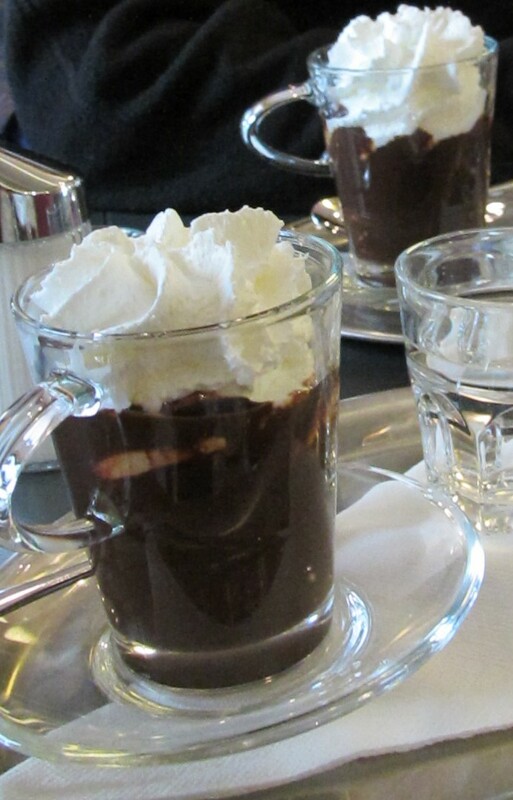 This Slovakian hot chocolate can permanently alter a person's mood to "upbeat."